Straphangers Say The E Is Far From Excellent! I have to say I think the straphangers graded this line pretty accurately outside of the top priority which I question a bit. 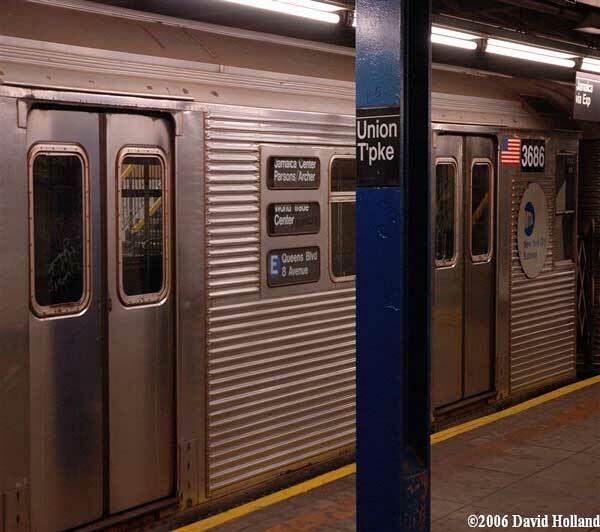 I have many years of experience riding this line especially dating back to my days of riding it to Jamaica Station for the Long Island Rail Road (LIRR) after hanging out somewhere in Manhattan. The while serving as one of the big two along Queens Blvd with its express partner, the train, does have its fair share of problems which prevent it from being what it could be. While I feel the line was graded pretty accurately, I do question the top priority. I am questioning why the riders feel that reasonable wait times is the #1 priority that needs improvement. What time of the day are they basing these feelings on? My years of experience riding the line tell me that wait times are not the #1 problem for this line. The E seems to have the most frequent arrivals along the Queens Blvd. corridor & definitely along the 8th Avenue corridor locally, hell possibly including the express. In my opinion the clear #1 priority that needs improvement is “Adequate room on board at rush hour”! This line is a complete nightmare to ride during the rush hour especially if you are not boarding at one of the first couple of stations on either end. I spent many trips standing from Lexington Avenue all the way out to whatever my destination was in Queens, usually anywhere from Kew Gardens-Union Tpke. & after! Unfortunately I don’t know what can be done about crowding on the E as there is little or no room for additional trains as the corridor is pretty much at capacity nowadays. If anything maybe 1-3 more trains could be added per hour & that is stretching it. Even if they were added, I don’t know how much relief it would provide as the line is truly that packed pretty much all times of the day especially rush hour! The E was lucky to only get a D in this category as a F would be the most accurate grade for it. Delays along the Queens Blvd. corridor are what most likely lead to “Minimal delays during trips” being the 2nd highest priority in need of improvement. With so many expresses running along the corridor, any little hiccup causes repercussions that are felt up & down the corridor. I also notice that the expresses have a huge habit of catching up with each other which causes minor delays here & there. Not surprisingly the only good grade the E earned was for the “Availability of MetroCard Machines” as it was the lone shiny grade earned that was above a C. Seriously did the MTA just paint in a B or B- for that category on every line? The only screwup in that category was the Staten Island Railway which earned a C. However I won’t count that since it is not a NYC Subway line. The amount of responses for this card was in line with what I thought it would be. With the E being one of the big 2 along the Queens Blvd. corridor, I assumed the least amount of responses received would be 5,000. Hopefully next year the total will be close to or more than double that! Maybe I should stop listening to Blink-182 as I write this entry & put on “Daydream Believer” instead!